Croydon BID’s campaign to promote responsible drinking and safer nights out has been given the thumbs up by licensees, businesses, the Council and Metropolitan Police. The Wise Up! campaign was launched in the run up to the Christmas, to focus attention on some of the issues affecting Croydon’s night time economy and to emphasise, in particular, what pub-goers and night clubbers themselves can do to feel confident of having a trouble free night out. Devised with support from Croydon licensees, the campaign highlights some of the risks that people run through excessive drinking and rash behaviour. It also emphasises the importance of planning ahead for a safe night out. Messages about knowing your limits, safe drinking, looking after your belongings, staying out of trouble and forwardplanning to get home safely, all feature on posters and leaflets that have been distributed through pubs, clubs and late night venues across the Town Centre to drive the message home. High profile, outdoor advertising sites across Croydon were also used in the run up to Christmas to reinforce some of the messages to the public at large. 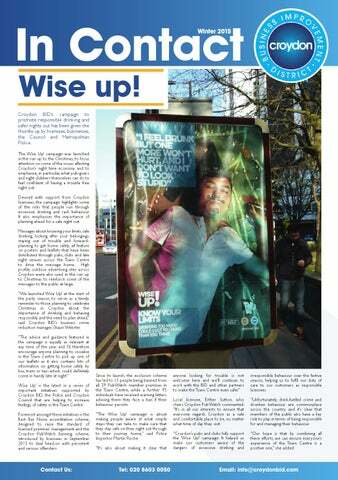 “We launched Wise Up! at the start of the party season, to serve as a timely reminder to those planning to celebrate Christmas in Croydon about the importance of drinking and behaving responsibly and the need to plan ahead,” said Croydon BID’s business crime reduction manager, Shaun Webster. “The advice and guidance featured in the campaign is equally as relevant at any time of the year and I’d therefore encourage anyone planning to socialise in the Town Centre to pick up one of our leaflets as it also contains lots of information on getting home safely by bus, tram or taxi which could definitely come in handy late at night.” Wise Up! is the latest in a series of important initiatives supported by Croydon BID, the Police and Croydon Council that are helping to increase feelings of safety in the Town Centre. Foremost amongst these initiatives is the Best Bar None accreditation scheme, designed to raise the standard of licensed premises’ management and the Croydon PubWatch banning scheme, introduced by licensees in September 2013 to deal head-on with persistent and serious offenders. irresponsible behaviour over the festive season, helping us to fulfil our duty of care to our customers as responsible licensees. Local licensee, Esther Sutton, who chairs Croydon PubWatch commented: “It’s in all our interests to ensure that everyone regards Croydon as a safe and comfortable place to be, no matter what time of day they visit. “Unfortunately, drink-fuelled crime and drunken behaviour are commonplace across the country and it’s clear that members of the public also have a key role to play in terms of being responsible for and managing their behaviour. “Our hope is that by combining all these efforts, we can ensure everyone’s experience of the Town Centre is a positive one,” she added. “Commercially, many of the Centre’s key anchor tenants reported sales increases of up to 10% on the day, in part due to the activities throughout the Town Centre and in the Whitgift. “The Crystal Palace FC Roadshow, a recent collaboration between the Club and the Whitgift, saw over 300 fans get to meet first team players and staff to obtain photos and autographs of their heroes. Meanwhile, our magical ice castle grotto, which was also launched as part of the day’s festivities resulted in over 30% more visitors than the previous year.” Matthew Sims, chief executive of Croydon BID said: “This year’s Christmas lights switch-on was a real cracker of an event. well. The turnout was great and the atmosphere amongst the crowds was truly fantastic, particularly ahead of our sparkling finale when we had the added benefit this year of the fantastic rooftop pyrotechnics display, courtesy of Centrale Shopping Centre.” “As always with these events, our aim is to attract more visitors into the town and ensure that they have a great time while they’re here as well as providing businesses with the opportunity to increase trade. All the indications are that we’ve achieved that on every count with around 72% of people surveyed at the event rating it as either good or very good and 44% telling us it had improved their view of Croydon.” Visit www.croydonbid.com to see more photographs from the event. Croydon’s got the X factor Croydon proved it definitely has the X Factor in December when the town received a visit from local X Factor finalist, Ben Haenow, and his mentor, music mogul, Simon Cowell. The pair were in town to drum up support from fans in advance of the contest’s live final which took place in London the following weekend and in which Ben went on to claim a decisive victory against fellow contestant Fleur East. 5,000 spectators who had gathered in North End, despite the rain, to see him on stage and hear him perform the Beatles’ classic ‘Come Together’ and John Lennon’s ‘Jealous Guy’. The event which was delivered with support from Croydon Council, featured on the final X Factor show and was widely reported in the national, regional and local press and broadcast media, helping to put Croydon firmly and positively in the spotlight for its local talent. For more photos of the event visit www.croydonbid.com. VIPs for a night The audience enjoyed a preview of the latest fashion and beauty trends, a live fashion show, plus beauty demonstrations and consultations at the same time as having the chance to take advantage of exclusive discounts and promotions available across the store. Around 60 shoppers were given the VIP treatment in the run-up to Christmas at an exclusive late night shopping event, organised by Croydon BID at the House of Fraser store. Half of the proceeds from ticket sales to the event were donated to local charity, Lives Not Knives, who provided the catwalk models for the evening. Visitors received free goody bags and a Check Out Croydon discount card, as well as being entered automatically into a prize draw to win a luxury hamper worth £450. Deep-cleaning efforts winning supporters of 255 man hours was spent powerwashing and removing gum from the streets. An area equivalent in size to almost two football pitches was deep-cleaned during the period, prompting business leaders in the Town Centre to comment positively on the transformation that has been achieved. “The street cleaning outside the front of Marks and Spencer is really making a difference to the standards outside the store,” commented Paul Reeve, store manager of Marks and Spencer. “I noticed the team out there again only yesterday removing gum and the focus on the area is really appreciated,” he added. About Croydon BID Our aim is to ensure that Croydon increasingly is regarded as one of the best places in south London to visit, work, live and do business by delivering positive change and improvements to the Town Centre that enhance its competitive position. We represent the interests of around 600 businesses and our projects and services directly reflect their expressed, up-to-date priorities, namely: that the town should be made safer, cleaner, better promoted, more attractive and more accessible. We are funded through a mandatory 1% levy collected from all businesses in the area with a rateable value of £40,000 or more. As a result, since the BID was first formed in 2007, in excess of £10 million of extra investment has been made on improving the Town Centre.